A Political Update from Washington, D.C. Since President Trump’s inauguration in January 2017, changes in the U.S. have constituted a sharp break from past U.S. policies and practices, and have been slightly unpredictable. The U.S. mid-term congressional elections will be held in November for the Senate and House of Representatives, both of which currently have a Republican majority. If the election is to result in a shift of power to the Democrats, this change will influence how the United States will fare nationally and internationally in the second half of the presidency. 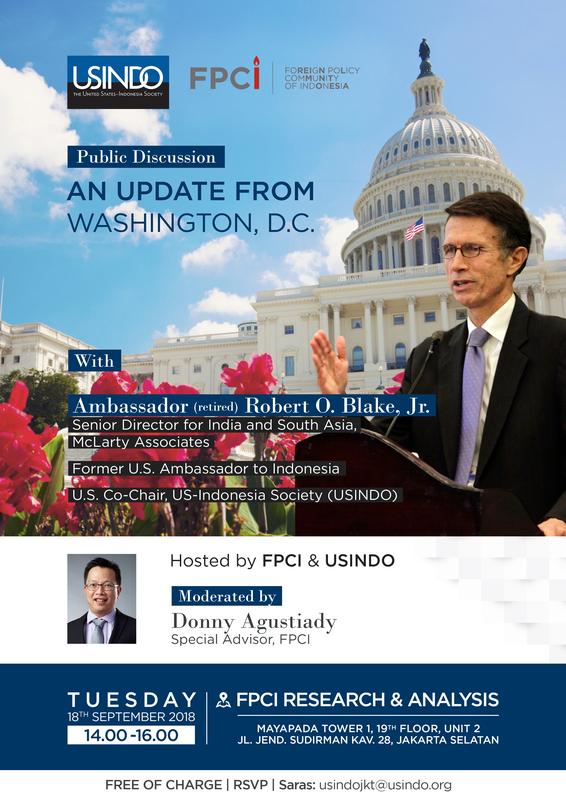 Ambassador Blake will take an early look at the upcoming 2018 U.S. midterm elections and give us an insightful update on the recent U.S. politics and foreign policy from the perspective of a Washingtonian. This event is free of charge. However, the space is limited and RSVP is required. To register, kindly RSVP, or email to usindojkt@usindo.org no later than Monday, September 17 at 12.00 PM to attend this Open Forum. Ambassador Robert O. Blake, Jr. was the U.S. Ambassador to Indonesia from 2013 to 2016. Previously, Ambassador Blake served for 31 years in the State Department of the United States and was nominated by former President Barack Obama to be the Assistant Secretary of State for South and Central Asia, serving from 2009-2013. He resigned his tenure as Ambassador to Indonesia in 2016 and now holds the position of Senior Director at McLarty Associates helping US business in South Asia and Indonesia. 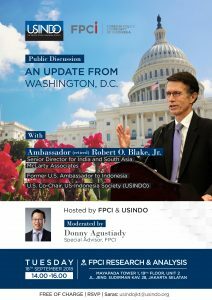 Ambassador Blake is the U.S. Co-Chair of United States Indonesia Society (USINDO). He received a B.A. from Harvard College and an M.A. from Johns Hopkins School of Advanced International Studies.